The name of this butte is rarely used anymore. But, at one time it was commonly known by area residents (see the old 1940's colorized postcard below). The old Skyline Trail that took hikers past the west side of its summit, has long disappeared - mostly absorbed by the state park's horseback riding trail. 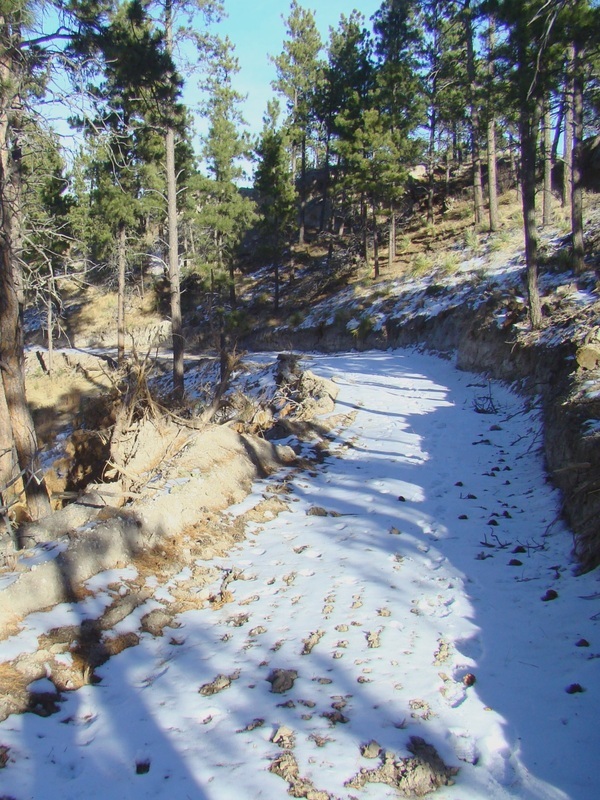 But, other parts of the Skyline Trail still remain as faint traces in the forest. Some of that was revealed when overgrowth was burned back in the forest fires of 2012. To hike to Split Rock Butte, the easiest route is to take the Cabin Trail from Pine Cone Butte parking lot, and hike about 1/4 mile down the trail. One of the trailheads is near that parking lot, just down the road a few hundred feet. Stay to the right at the trail junction and Split Rock will be on the right side of the trail. Since the rock faces are over 100 feet high and the rock is unstable, climbing the face is pretty risky and discouraged by park officials. 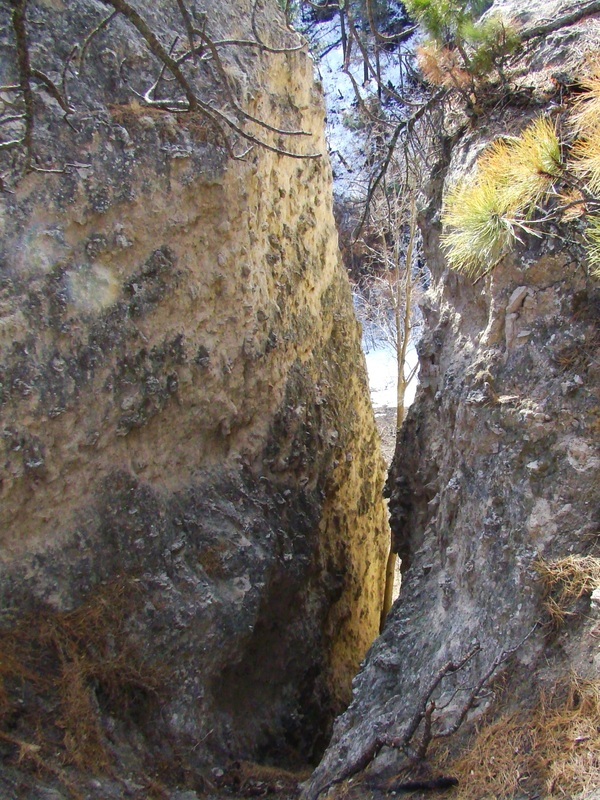 But, it is easy to scramble around either side of the rock faces and gain access to the summit area. 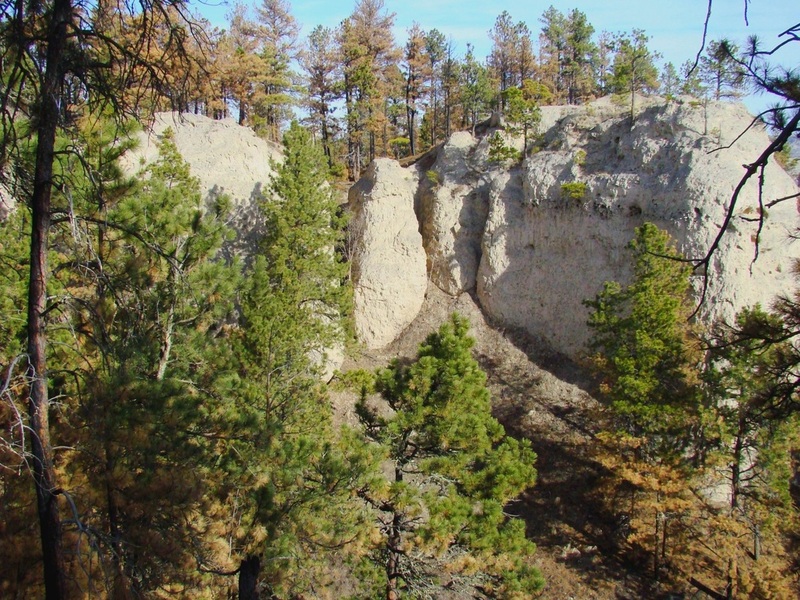 When you are at the summit, it will be readily apparent how the butte got its name, as there are at least five distinct splits in the butte - top to bottom. 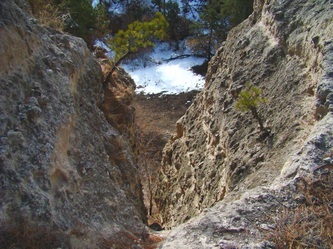 The horseback trail that passes behind the summit is shown on the Nebraska Interactive Trails map. 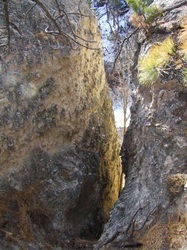 This is one of the rock splits that help give the butte it's name. The west end of Split Rock Butte as it appears in 2013 - in contrast to the 1940's postcard view at right. 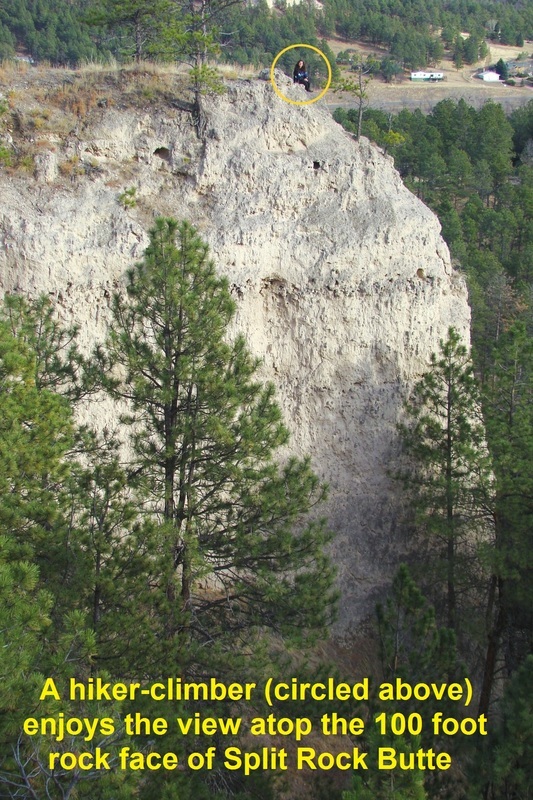 Here a hiker rests on the summit edge of the rock face of Split Rock Butte. 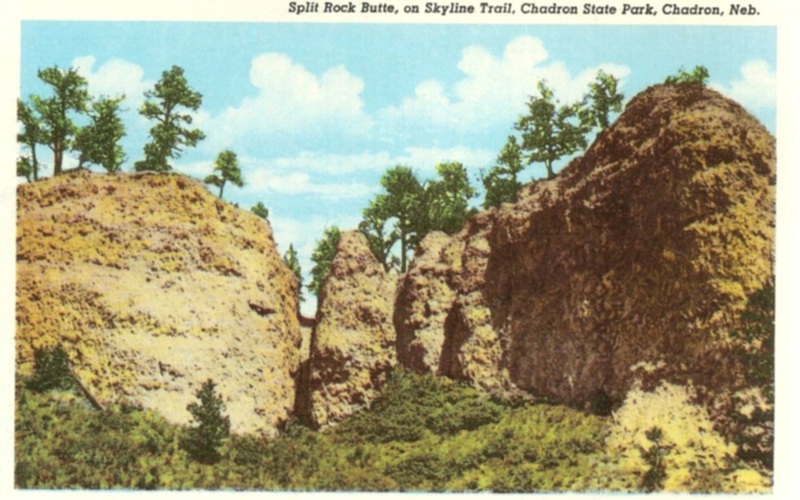 This is a 1940's colorized postcard view of Split Rock Butte. 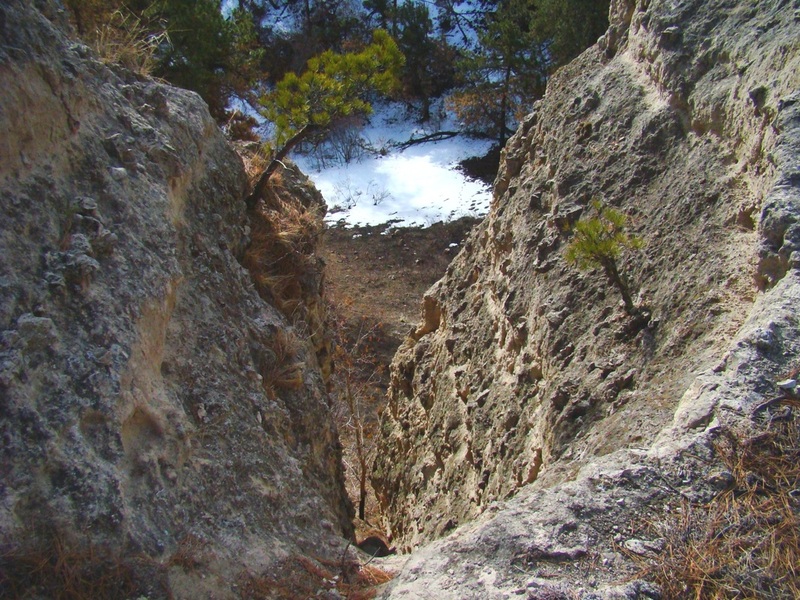 This is another split in the the butte. 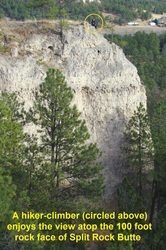 This is the Cabin Trail close-up view of Split Rock Butte. The forest fires of 2012 have damaged some of these trees since this photo was taken. 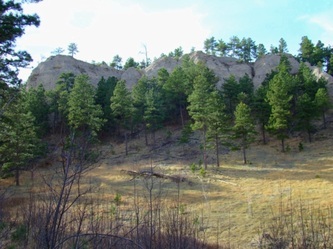 This is the horseback trail behind Split Rock Butte, that was originally part of the old Skyline Trail. 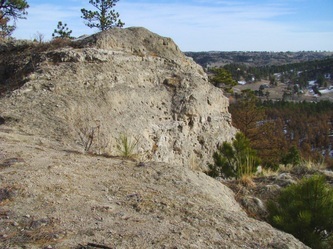 This is the true summit of Split Rock Butte.